Opposition supporters shout during a gathering in front of the United Nations offices in Caracas, Venezuela, March 12, 2018. Venezuela's opposition alliance called on the United Nations on Monday not to send observers to the presidential election on May 20 to avoid legitimizing a poll it says is rigged in favor of Socialist President Nicolas Maduro. Venezuela's President Nicolas Maduro gestures as he talks to the media during a news conference in Caracas, Venezuela, Feb. 15, 2018. "What we have asked the United Nations today is not to validate the electoral fraud in May," said legislator Delsa Solorzano of the Broad Front coalition at a small demonstration outside a U.N. office in Caracas. She added that any U.N. mission should "be only for human rights issues, not to validate a dictatorship." A U.N. spokesman contacted via email said the government's request for a mission had been received. "But our position on all such matters is that the sending of electoral observers requires a mandate from one of the U.N.'s Member State bodies" such as the Security Council or General Assembly, wrote spokesman Farhan Aziz Haq. "If the (General Assembly) or the Security Council were to provide a mandate, we would respond accordingly. But neither has done so up until now." 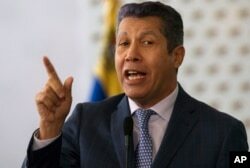 Former state governor Henri Falcon has broken with the coalition and will run against Maduro, insisting that Maduro's low opinion poll numbers make him a weak candidate. Critics say the government is likely to manipulate the vote results and that participating will legitimize the process. 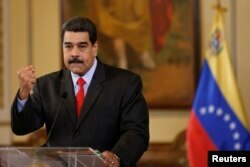 Maduro says his government is the victim of an "economic war" led by the opposition with the help of Washington. His critics say the country's problems are the result of dysfunctional socialist policies.